I am back from two days of sheer coding, brainstorming, strategizing and bonding. It was one of the most tiring weekends I’ve ever had. I drove more than 100 kilometers going to and fro. Trek. Report. Hack. Adapt. Achieve. This year’s theme was using technology to make a significant social change. It was a good theme — a practical one — given that most hackathons focus on bringing out the best programming talent. Rehabilitation of PTSD and motor impaired patients is heavily dependent on follow up therapies. While a PTSD patient goes through several psychotherapy sessions, a motor impaired patient takes up many physiotherapy sessions during their recovery period. There are two major problems that come in the way of a patient being able to take up therapy sessions: cost and mobility. Our solution addresses these problems through a system of applications that provide an effective and cost-free way of delivering professional-grade therapies to patients in the absence of a doctor, and automatically tracking their progress. It is to be noted that our solution is NOT MEANT TO 100% replace doctors and medical experts but rather aims to: ● save patients additional costs that they would otherwise spend doing follow up sessions, and ● make the entire process hassle-free and fun to improve motivation levels for taking up sessions at home. Phase 2 was the actual hackathon. It was time to put our ideas to code. We were competing with 25-30 other teams (of 2-4 participants each). Only 10 would make it to Phase 3. The venue was the renowned Netaji Subash Institute of Technology (NSIT) in Dwarka, Delhi, where getting an admission is — quite literally — more difficult than getting on a plane to Mars. The college buildings are in pretty bad shape. I can write a whole book on how pathetic the venue was, but that’s for another time. When Shivam and I entered the main auditorium for the opening ceremony, all we could see were throngs of young guys and girls. All students, no working professionals? It was an unsettling feeling for the both of us. 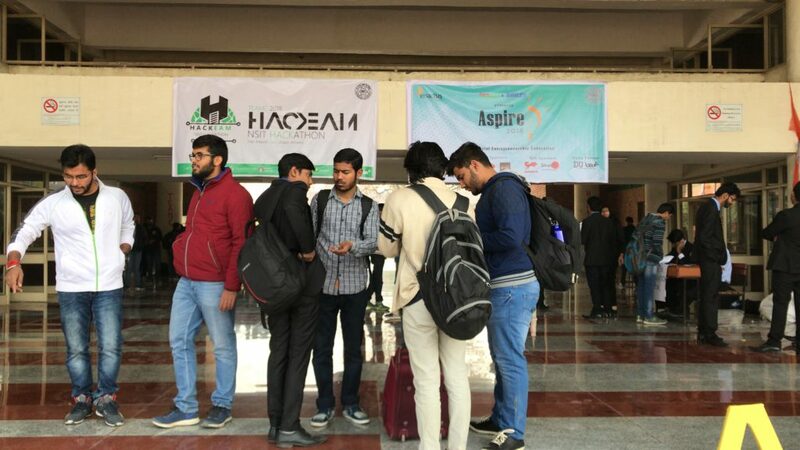 We knew beforehand that this hackathon would attract more students than professionals, but just two professionals? Really? So out of place felt we that we broached the main organizer (and head of the computer science department) Dr. Shampa Chakraverty to confirm whether it would be really fair for us experienced folks to compete with students who had had zero real-world experience. Everything post that point was delayed – snacks, dinner, midnight snacks, evaluations, sleeping arrangements… you get the idea. Anyway, after 2 hours of delay, the hackathon finally began. We got to work straight away. Everything post that point was delayed – snacks, dinner, midnight snacks, evaluations, sleeping arrangements… you get the idea. The organisation was pretty screwed up, and a lack of leadership and direction was clearly showing among the organizers, who were as clueless about things as we. Shivam and I interacted with a few teams, and secretly stopped by to see what others were working on. We were pretty blown to see how much smarter the upcoming generation was in terms of both technical skills and ideation. Then again, a sizeable number of participants were first and second year students of NSIT, that attracts one of the best and the brightest of India year after year. Writing three applications and a cloud backend in just 24 hours was a tiring yet fun experience, but not something we had not done before. As software professionals, we are used to doing coding marathons every now and then to meet deadlines. We used node.js, Angular, Ionic, Bootstrap, Raspberry Pi, Microsoft Azure, and a whole bunch of other cool stuff to create our apps. In sum, we enjoyed coding, thinking, coding, rethinking, going out on a stroll, coding, eating, and coding again. Night went on, and morning came pretty fast. We were visited by 4 different evaluators, all of whom appreciated our idea and solution. We wrapped up our coding a couple of hours before the official closing time. Results of Phase 1 and 2 would be announced soon. We gathered in the same auditorium that we had visited on day 1. It was full of young guys and girls waiting to hear good news. After two hours of mindless waiting, Dr. Chakraverty announced a good news – instead of 10 the final shortlist had 12 teams. Then came the bad news – we weren’t one of 12. In fact, none of the 5 other teams in our room was selected, despite this one particular team getting extremely rave reviews from our final and main evaluator. As it was already very late, Shivam and I left the place. Empty handed. There were no physical participation certificates to be collected. As disappointed as we were, we took away not dismay but the learning experience and a resolve to never in future participate in students’ events. Was it a weekend well spent? Maybe not so much. Our solution’s full source code is available on github. Perhaps someone will find it useful. P.S. We were later informed by a student organizer about our winning an award in a special category (that was perhaps invented on-the-spot after realizing that a lot of good ideas were not recognized in the top 12). We had awarded the Best Research award but we weren’t there to receive it. Next post: DigitalOcean is fun, but is it worth it?